This is a part of a new series that I am debuting on Boost Your Photography called "Behind the Shot." 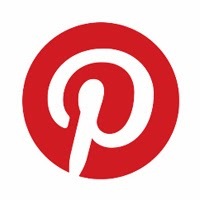 The internet has fostered the proliferation of incredible photography and highlighted many spectacular locales. This series serves to pull back the curtain just a little bit - to take a look at some of what goes into getting those print-worthy masterpieces, as well as to highlight the importance of what else is going on just outside of the shot. 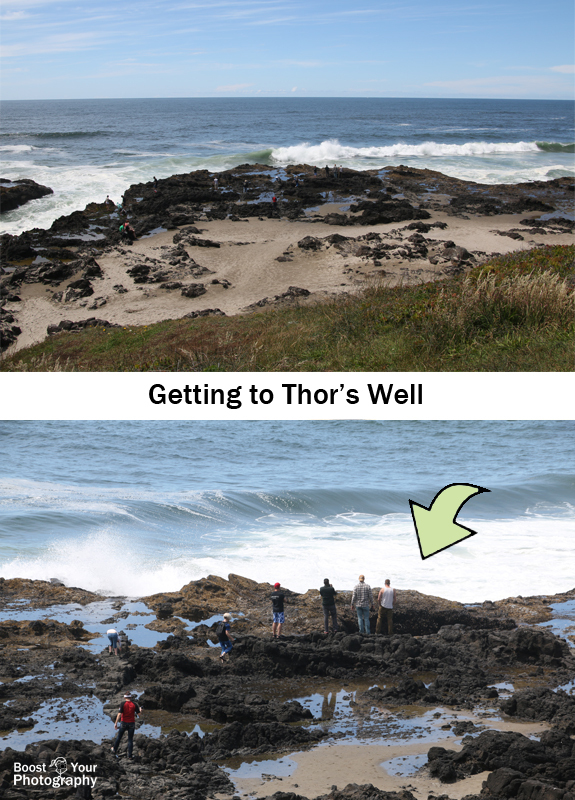 Thor's Well is a geologic feature on the Pacific Coast in Oregon. It has become a highly-sought photographic spot for the deep sinkhole look that is created as water pours back into the ocean through the well. The well also creates a splashing geyser effect as the water rushes in and dashes against the sides. 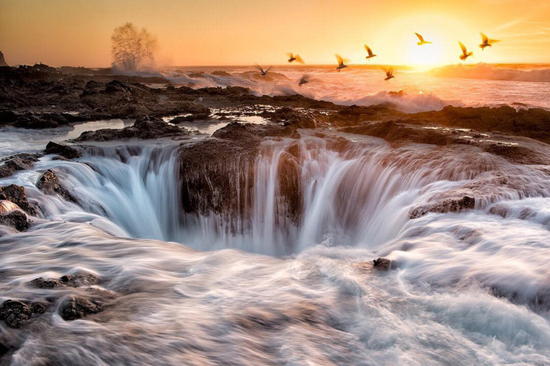 The image above represents the idealized view of Thor's Well: the gorgeous sunset colors, the splashing ocean backdrop, and the sense of silence and serenity created by the long exposure time and the slowly falling water. Zoom back slightly, however, and the image below represents the reality: the crowds of other photographers hungry for the same shot, the unpredictable splashing of ocean water, and so on. Thor's Well is located on the coast of Oregon just south of Yachats (which has a great local brewery and many different hotels, if you are looking for a home base during your shoot). You can get a map of the area from the Cape Perpetua Visitor's Center. There is a very small parking lot for the well at the top of the hill, just off the road, otherwise you will need to hike in a little ways from other nearby parking lots, along one of several marked trails. You can see the well itself from the road. Not sure exactly where it is? Just look for a crowd of folks with cameras staring down at their feet ... presto! I recommend arriving early enough to scope it out before sunset, so you know where you'll be heading. 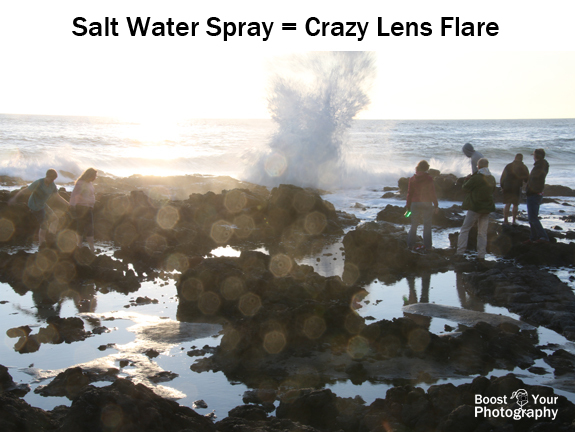 Depending on the tides, daylight shots can also provide the same splashing or sinking effects. As for can see in the wider shots, above, about the only place to stand is on the higher outcroppings of rock that surround the well. Depending on the tide (and the height of your footing), be prepared to get splashed or have water run up and over your feet. Shooting near water is unpredictable. There are signs up and down the coast that warn about "sneaker waves" - unexpectedly large surges of water that can (and have) surprised people and dragged them out to sea. The closer to high tide, the more water will be flowing up, over, and around the area near Thor's Well. 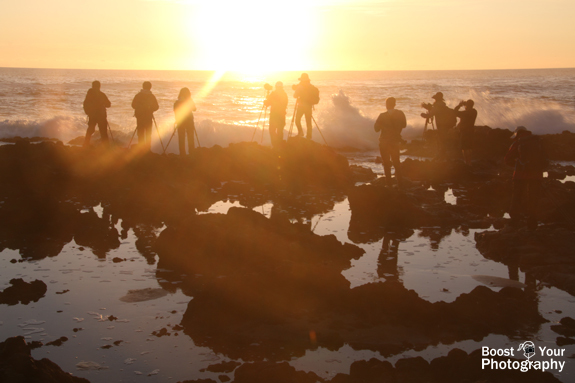 Keep a firm footing and prepare to be splashed if you attempt photographing near high tide. Finally, be respectful. This is a gorgeous natural area, and you should not do anything that might damage it. 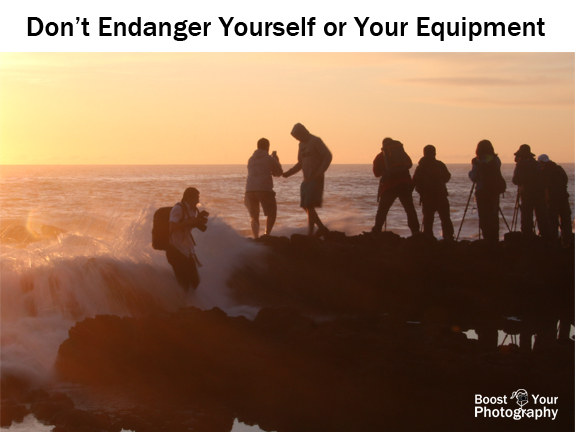 Be considerate of other photographers as well. Take your time, compose and capture your shot, and then let someone else try your vantage point. There are very limited places to safely stand and shoot. When: near sunset. Closer to high tide means more water (and more risk), closer to low tide means more dramatic splashes but less overall water. What to bring: camera, wide lens, sturdy tripod, polarizing or neutral density filter, remote shutter release, and plenty of lens clothes and cleaning spray. Wear sturdy shoes and pants that you don't mind getting wet. What else to see: just south of Thor's Well is a featured called the Spouting Horn that shoots off tall streams of water during high tide. A short hike to the north is The Devil's Churn, a narrow inlet that can throw water several hundred feet in the air as the tide comes in. It is also well worth the short drive up to the Cape Perpetua Overlook for distant views up and down the coast. 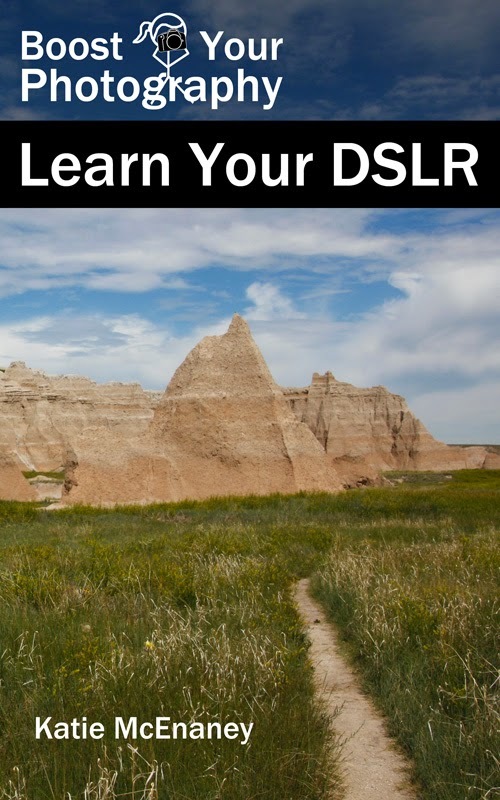 Remember that photography is not simply trying to replicate the same shot you saw online. Of course you want an iconic shot of an iconic location, but take the time and energy to devote to really adding your personal spin on it too. A shot that is truly "yours" is likely to be more memorable. 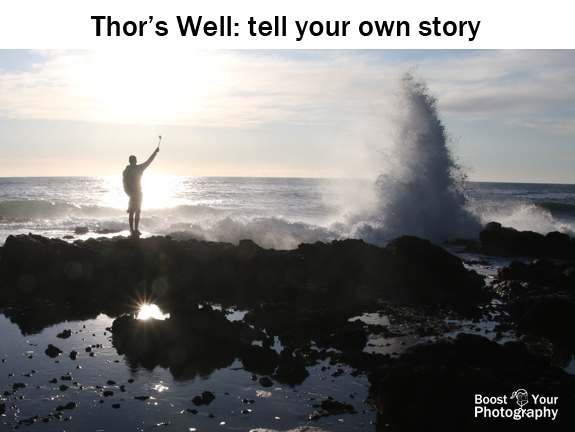 For me, I visited Thor's Well on a personal vacation, without a tripod or polarizing / neutral density filter. I enjoyed finding ways to tell the story of the well rather than simply capturing the well on its own. 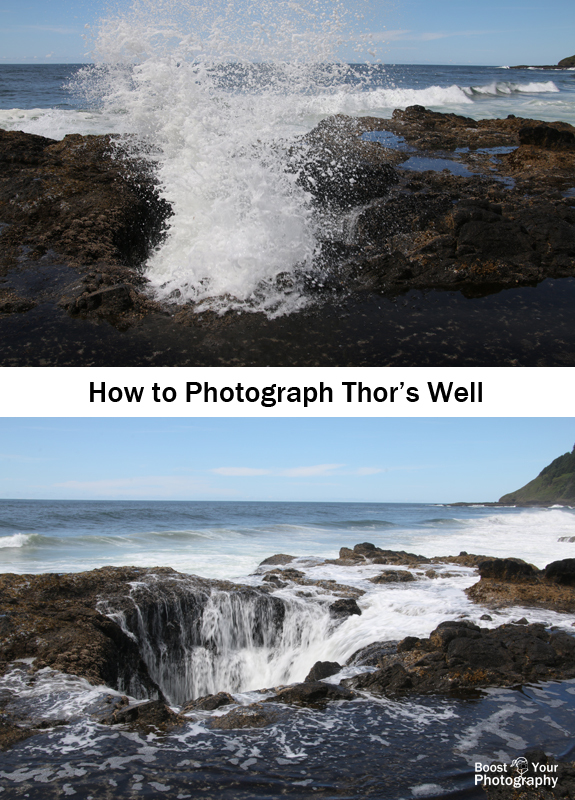 Have you been to Thor's Well? What other places or images would you like to see featured in a future "Behind the Shot" style post?